According to Forrester/Internet Retailer B2B Buyer research, 53 percent of B2B buyers will make half or more of their work purchases online by 2018. In addition, 93 percent of business-to-business buyers say that they would prefer to buy online, where they can access more self-serve information, direct from vendors. Because of this, B2B organizations are now rushing to build better customer experiences by offering online options, and they want to do it in a way that mirrors the online experiences consumers have come to expect. Worldwide, 2.32 billion people now have smartphones and it’s only projected to grow. Just like B2C buyers, B2B buyers are looking to do more and more shopping from their mobile devices, and B2B merchants need to make it easy for them. Formatting for mobile is just the first step. Mobile shopping also needs to be easier and include useful tools that buyers and sales staff can use to complete the buying process. Customers of Calgary-based Construction Fasteners & Tools needed to be able to shop from their work sites, so they upgraded to a responsive site and added additional filter capabilities to customize category pages to simplify search results for categories that are more important to a business buyer. For example, if a consumer searches for a cordless drill, the brand will be most important because that is the most important factor in the purchase decision. But when searching for screws or nails, the focus may be on product specifications like diameter, length, and price. By understanding the customer experience and preferences that happen from their clients when they are shopping from a mobile device, Construction Fasteners & Tools has seen more than 550 percent growth in mobile revenue. Australian Pharmaceuticals Industries Limited (API), one of Australia’s leading pharmaceutical distributors and fastest growing health and beauty retailers, with a wholesale business that generates $2.5 Billion in annual revenue. Fifty percent of their revenue is generated online, and they wanted to design a mobile scanning app, “ScanAPI”, to work with customers’ smartphones. Now, customers can simply scan barcodes to reorder products directly from the pharmacy aisle—removing the need for their employees to carry brick-like devices back and forth to upload scanned items. Another simple example is from, Rainbow Treecare, a tree health specialists based in Minnesota. Rainbow Treecare built a mobile Quick Order form that allows their sales representatives and customers add a list of items to the cart in just one click of a smartphone or tablet, making it far easier to complete their purchases while they’re in the field with clients. For B2B businesses, a digital presence means more access to their clients and prospects. 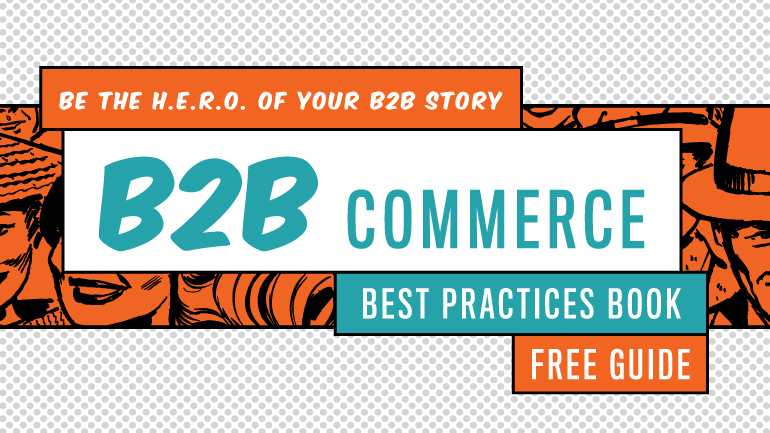 By adding commerce to their traditional website, B2B can get better visibility in their market, and provide around-the-clock availability to their clients. Rainbow Treecare is seeing that dynamic and their customers are now buying more of their proprietary products. Their B2B customers are more and more using the new website to order outside of normal business hours, at night and on weekends, a time when they aren’t normally open for business. API is also seeing this benefit in a different way. Customers are now benefiting from access to digital documents making it easy to review their order and return history and status. By enabling core self-service features online, API made it easier for wholesale customers to work with the company while significantly reducing operational costs. It’s now possible to take orders 24 hours a day with no added sales team. Regulatory compliance is a big issue for many B2B merchants and online tools can not only handle that burden, they can automate it—round the clock. This is a huge help to sales and accounts teams who can be freed up to focus on other client management tasks. In APIs case, there are strict rules about which type of pharmacy can dispense which medicines. With online tools, API can easily manage and apply regulatory rules, and to tailor content and product catalogs by pharmacy type. Rainbow Treecare uses ordering and shipping rules to automatically account for state-specific restrictions on items like chemicals. An online presence also gives B2B merchants the ability to set up multiple ordering and payment options, including paying by credit card, invoicing, and pay-on-delivery. Storage solution provider Rousseau Metal has created a tool that is used daily to take quote requests by both internal and external stakeholders. The result of moving this online was a 227 percent increase in completed Bay Design quote requests. Commerce capabilities are also creating efficiencies during the ordering and payment processes. For example, API created a backorder system that allows customers to place orders on out-of-stock products which reduced customer service calls by 20 percent—practically overnight. Rainbow Treecare created a program where customers place orders for the busy spring season called the “Early Order Program”. It is helping to drive existing customers to the site so that they can update their customer information and is driving addition orders online. The convenience and service are also encouraging new customers to buy. Along with multi-site and multi-language capabilities, online tools give B2B merchants the ability to personalize their client experiences. API’s myAPI calculates complex pricing logic in real-time from a dataset that included over 6.3 million combinations. This allows wholesale customers to immediately see the best pricing and deals for every product. Customers are saving time and are finding easier to get the information they need, leaving them more time to service their own customers. Personalization gets to a new level at Nestle Health Science’s NCare branch where order creation on a user-access level basis provides individual pricing models differentiated by various factors ranging from geographic location to institutional contract agreements. Germany-based heavy equipment supplier Liebherr created roles for relevant industries with customized store views, ensuring the highest quality of service, customer loyalty, and has significantly reduced the risk of incorrect orders. Additionally, Liebherr’s service partners can log in and see orders for their customers and prepare and approve quotes. Their system supports multiple buyers from a single company or service partner, delivering transparency while serving all customers from the same platform. We’re seeing B2B clients in a wide-range of industries worldwide enhance and even revolutionize their businesses through digital commerce and related services. B2B commerce has made it easier for them to operate, do business and elevate their customer experiences—the ultimate key to growth. Take a look at our B2B guide about how to apply these strategies to your digital transformation.